I tried to eliminate hexadecimal from the editor as much as possible, but maybe it would be nice to add a toggle to show everything in hex? I imagine it would be useful when cross-referencing with other tools and docs (which are mostly in hex). I'll add the cursor coordinates to the top bar next to the zoom control. That's a good idea and it should be pretty easy to do. I can make trigger coordinates visible in the properties list too. I'd also like to add a more user-friendly control for choosing the destination tile for entrance/exit triggers (and similar objects). It will be a little preview of the destination map in the right-hand pane and it will be draggable so you can move the destination tile. I also want to add a little dropdown next to the layer toggle buttons that has a few different mask overlays (passability, layer priority, etc.). This will be especially helpful for FF1 and FF4 where the tile properties determine where random battles are enabled, and where map exits are located. Search for "worldGraphics2" and change its "range" to "0xEF7D07-0xEF9D17"
Search for "worldLayout2" and change its "range" to "0xEF4A46-0xEF7D07"
I tested this out on an expanded ROM and it worked. I've been working on adding more support for FF5. The event editor is now live and I'm making good progress on the battle editor. Here's a preview. (01-18-2019, 11:47 PM)Everything Wrote: I tried to eliminate hexadecimal from the editor as much as possible, but maybe it would be nice to add a toggle to show everything in hex? I imagine it would be useful when cross-referencing with other tools and docs (which are mostly in hex). 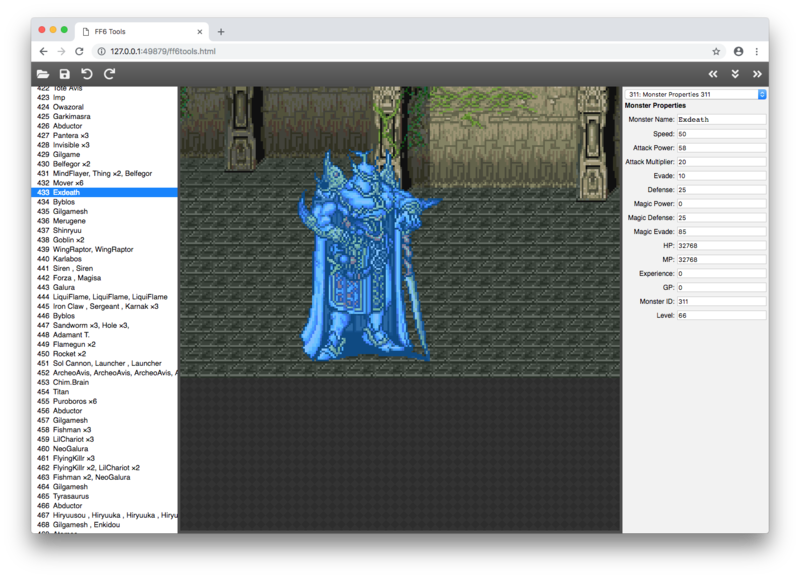 Yeah that's why I came up with the suggestions, I have to open FF6LE/ZoneDoctor at the same time for referencing maps ID, Y X locations and tile solidity. (01-18-2019, 11:47 PM)Everything Wrote: I'll add the cursor coordinates to the top bar next to the zoom control. That's a good idea and it should be pretty easy to do. I can make trigger coordinates visible in the properties list too. I'd also like to add a more user-friendly control for choosing the destination tile for entrance/exit triggers (and similar objects). It will be a little preview of the destination map in the right-hand pane and it will be draggable so you can move the destination tile. I did some quick tests and it didn't work for me, I'll have some free time in the next few days so I can test correctly, will report back. 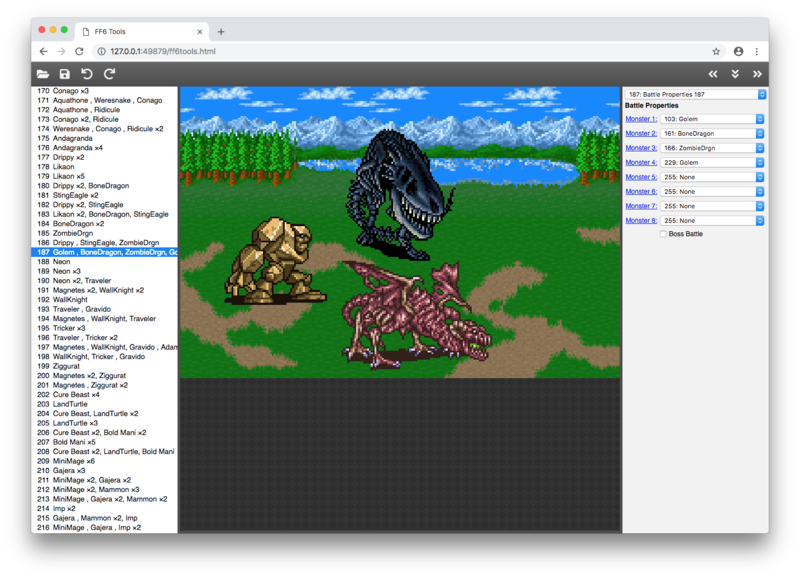 (01-18-2019, 11:47 PM)Everything Wrote: I've been working on adding more support for FF5. The event editor is now live and I'm making good progress on the battle editor. Here's a preview. 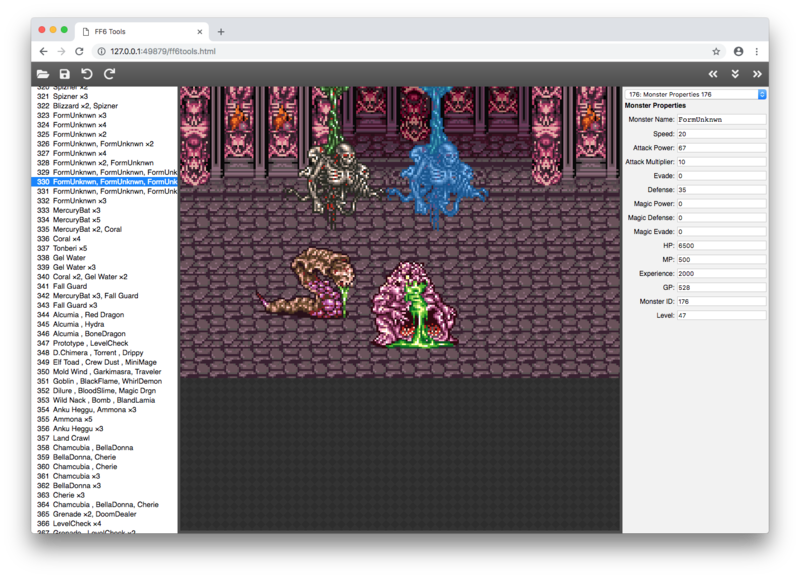 (01-18-2019, 11:47 PM)Everything Wrote: EDIT: I think I figured out why the WoR graphics can be corrupted after expanding a ROM with FF3usME. For some reason, after making certain changes with FF3usME the WoR graphics and tile layout get swapped. I have no idea why, but Lord J must have had a good reason for doing that. He had no reason other than putting the graphics and tile layout in the same order as the WoB ones. That is why he released FF6LE Rogue; to ensure that compatibility with FF3usME. I added new treasures a while ago just to realize today that there's no rooms for new treasures so it started to delete treasures in maps 410/408/406 without any warnings, so if you could add a warning or some kind of lock to avoid overwriting existing treasures (I suppose the same can happen with event and entrance triggers) that would be great. Also, is there a way to add more treasures? if I look at the chest data doc from Imzogelmo, it seems like there's room at the very end in map 415 (hidden map) but I suppose those requires space in SRAM and they all have the same Encoding byte:bit except the last 3 which uses different ones. I know Madsiur did some trigger expansion with FF6LE and ZoneDoctor map editors but that's about it (download link is dead btw). (01-19-2019, 11:33 PM)Warrax Wrote: Also, is there a way to add more treasures? if I look at the chest data doc from Imzogelmo, it seems like there's room at the very end in map 415 (hidden map) but I suppose those requires space in SRAM and they all have the same Encoding byte:bit except the last 3 which uses different ones. The SRAM right after the treasure chest bits is free, you can add more with the regular FF6LE or FF6LE Rogue. Maybe FF6Tools does not allow that SRAM to be used for treasure chests..
(01-19-2019, 11:33 PM)Warrax Wrote: I know Madsiur did some trigger expansion with FF6LE and ZoneDoctor map editors but that's about it (download link is dead btw). Which link are you talking about? The link for FF6LE CE on the utility page is working..
(01-20-2019, 11:14 AM)madsiur Wrote: Which link are you talking about? The link for FF6LE CE on the utility page is working.. Sorry I don't remember where this patch is from.. For FF6LE CE the expansions can be done with the editor. (01-20-2019, 12:39 PM)madsiur Wrote: Sorry I don't remember where this patch is from.. For FF6LE CE the expansions can be done with the editor. I specifically wanted to see the ASM file included. Edit: I realize the archive is from 2015 and the FF6LE CE archive includes "asm_changes.txt", do you remember if it's the same file? I assume it is, just want make sure. @Everything I also want to add that the issue with creating new treasures when using FF6tool also happens with events. I created a couple of new save points and it started deleted existing ones without warning. (01-20-2019, 01:56 PM)Warrax Wrote: @Everything I also want to add that the issue with creating new treasures when using FF6tool also happens with events. I created a couple of new save points and it started deleted existing ones without warning. Keep in mind that the treasure bits in SRAM (I called them "switches" in FF6Tools) don't correspond 1 to 1 with the treasure triggers. This is how the game keeps track of whether you've collected a treasure that appears in several different maps (e.g. Cave to South Figaro). So there should be no problem using more event bits in SRAM. Currently, you can have up to 384 treasure bits ($1E40-$1E70), but I'll change it so that you can use up to 512 (using the unused space in $1E70-$1E80). I think vanilla only uses 259 bits, and FF6 Advance only uses about 300, so you would have to add a TON of new treasures to need more than 384. (01-20-2019, 01:56 PM)Warrax Wrote: Edit: I realize the archive is from 2015 and the FF6LE CE archive includes "asm_changes.txt", do you remember if it's the same file? I assume it is, just want make sure. Yes that text file is the final version of the ASM changes.